The most convenient Vendor Finance Option to buy a property in Italy without a mortgage within ten years is offered by Rent to Buy. It is a very flexible contract used to tailor the juridical and financial bases of the agreement to the Vendor’s and the Buyer’s needs. The original concept of Rent to Buy was as a short-term payment plan, which allowed the purchaser to get access to a bank loan within a few years and to take possession of the property from the date of signing the contract. Rent to Buy’s financial structure works as follows: the purchaser buys the property in monthly instalments of which a significant part is paid towards the sale price and a marginal part as rent. The specific proportions of these two elements can be negotiated by the parties. This payment method results in completion at the end of the contract and the consequent transfer of the ownership of the property (Rogito). However, the purchaser has the right to anticipate the closing of the contract (Buying Option) by paying the whole sale price. If he exercises this right, from that moment he will benefit from the fact that he no longer has to pay the monthly rent for the use of the property. In 2014 Rent to Buy was formally introduced into the Italian legal system with the Decree 133/2014 – Art. 23 (Decreto Sblocca Italia). Soon after the details of its fiscal implications were properly described by the Italian Revenue Agency (Agenzia delle Entrate) in Circolare 4/E 19.02.2015. This reconfirmed the complete implementation of this juridical instrument as a secure method to buy property in Italy. This new Decree has brought in a different way to use Rent to Buy as it defines it as a payment plan which completely replaces the mortgage with a maximum term of 10 years. Its distinctive feature is the compulsory 10 years filing of the deed, which represents the most remarkable legal protection as it gives the buyer security in the case of the seller’s bankruptcy or death or in the case of creditor aggression on the property. The typical Rent to Buy agreement is a contract which includes both the sale-purchase and lease agreement in a single deed. We have developed for our clients a contract called “Long Rent to Buy” which will make the purchase a NO-STRESS, cheaper and easier experience. Our Long Rent to Buy contract is completely in harmony with the legal framework described in Decree 122/2014, Art 23. – Minimum 10% down payment as a deposit. 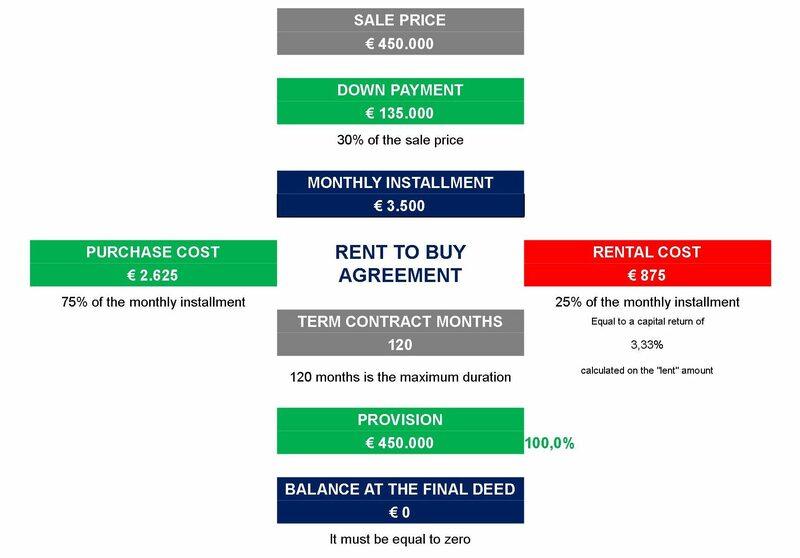 – Regular monthly payments: 75% as an instalment towards the sale price and 25% as rent for the use of the property. A) The Buyer will save money because the non-resident mortgage cost would have been higher than the 3.33% paid as rent. B) The Seller gets 3.33% capital return of the “lent” amount until the termination of the contract or upon the purchaser’s Buying Option call. The Buyer has always the right to activate the Buying Option paying the full sale price and completing the property ownership transfer. 1) The Deed will be filed for 10 years. 2) Immediate use of the property. 3) The possibility of sub-letting the property for short-medium-long term, thus financing (partially or totally) the monthly installments. 4) The possibility of handing over the contract, meaning that there is the opportunity to earn money on the resale within 10 years and not to have to pay the transfer tax. • Payment of a reasonable down payment as a deposit. • Saving money on the mortgage tax (as explained above). • Saving the mortgage tax (2% of the lent amount), the administrative cost of the bank procedure and the cost of the compulsory purchase of any bank insurance linked to the loan. • Saving time: no need to provide an endless list of documents to be translated and notarized in the Italian Consulate. All these points clearly demonstrate the strength of control, both juridical and material that the Buyer will have over the property right through the duration of the contract.